Here’s a short conversation between me and Kevin Everson, a noted filmmaker and Professor of Art who embodies the best of today’s principle: Kuumba/creativity. 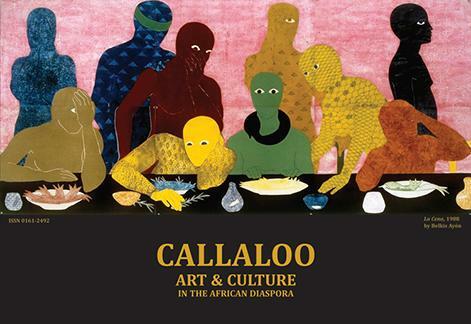 This is a short excerpt from an extended interview featured in the inaugural issue of Callaloo Art, which was published in October. Every year Everson appears to push his art form in new and exciting directions. This year, he’s been quite active on the festival circuit with his most recent films, FE 26 and Sound That. In those films and others, Everson’s judicious fusion of scripted and documentary moments not only blur the lines between fiction and reality but also complicate conventional ideas about race, politics, and community in 1970s America. Twenty years after gaining national attention as a featured artist in Thelma Golden’s highly controversial “Black Male” exhibit at the Whitney Museum in New York City, you remain a central and influential figure in the world of experimental art. Talk about your artistic development and the institutional spaces that nurtured your embrace of formalism. Kevin: As an undergraduate in the late 1980s, I was involved in a number of group shows at the University of Akron School of Art in Akron, Ohio. I primarily made mixed medium sculptures that used a variety of materials such as handmade paper, metal, paint, blood, sperm, ink and other ephemera. For one particular exhibition, my parents drove down to Akron. They were pleased with the work but puzzled to say the least. I realized I had to think about making art that would be more generous and allow for a more expansive set of references and experiences for different viewers, but still embrace an art language. I had to develop a strategy that would be inclusive for communities, working class Midwestern Black folks and the local, national and international art worlds. Claudrena: Could you discuss that strategy? Kevin: The strategy I laid forth was craft. I wanted the work to look professional or well made. I like the conversations that evolve around well-made objects. I began to make multiples objects. The viewers often assumed I engaged in this process of making multiples for some Joseph Beuys-esque reason or strategy. That could not have been further from the truth. I made the objects look good as the most direct and honest way to impress the “crafts person” or the layperson. It was an avenue for ‘folks’ from different levels of discipline and familiarity to enter the work. Claudrena: Though you’re primarily known as a filmmaker, photography was your principal medium of expression during the early years of your artistic career. As several readers might be aware, Thelma Golden’s 1994 “Black Male” show at the Whitney Museum featured your poignant photographs of unidentified black men from Mansfield, Ohio. As was the case for many African American artists of your generation, the 1990s was an exciting time. Kevin: Most definitely. In 1990, following graduate school, I moved to my hometown, Mansfield, Ohio for three months. I was waiting for my studio in Cleveland to become available. At the time, I was making pictures of whatever I could. Since I did not have access to a darkroom, I was sending my pictures to One-Hour photo stores to get negatives and prints. The images were returned to me in their standard custom photo-envelopes. In previous years, I would give my parents large-scale black and white portraits of post-industrial Midwestern cities. Those pictures were too big and devoid of color for a small working-class home. Safe to say that those pictures never made it to my mother’s walls. To my surprise, I was amazed to discover that my standard custom photo-envelopes were missing. Turns out that my folks were taking the pictures to work and showing people the images. It was the literal proof of the relative and relevant contexts these photographs could be disseminated. I realized I had to explore the conditions on what, where and how ‘Art’ is viewed by and in multiple communities. So where did this exploration lead you? In 1994, I made a series of sculptures entitled Mansfield, Ohio End Tables. The sculptures were designed after the end tables my parents owned in the 70s, variations on watered down Dutch modernism. At the time I was interested in objects that presented ‘art’ in the African-American working class home. The Mansfield, Ohio End Tables had framed photographs of Black prison guards on them. My concept was to display the new economy, which was and still is, the penal institution. This type of furniture, functional and slick, was popular in the working class neighborhoods of Mansfield, Ohio. I was fortunate to have several of the Mansfield, Ohio End Tables on display in the Black Male exhibition at the Whitney Museum of American Art in New York in 1994. I was pleased with the results of the pieces but I was unsatisfied with the overall function of the piece. At issue: I was more engaged with envisioning and exploring the actual process of acquiring an end table. The object needed to necessarily reflect the process of commerce, acquisition and display. Thus, I wanted somehow to be able to show the mechanics of acquisition–how one would work five-days-a-week, go to the furniture store on the weekend to select an end table, bring it home and find a place to put it in the front room of their home. At this moment, I realized that a time-based medium would more accurately project what I wanted to say and to reveal.